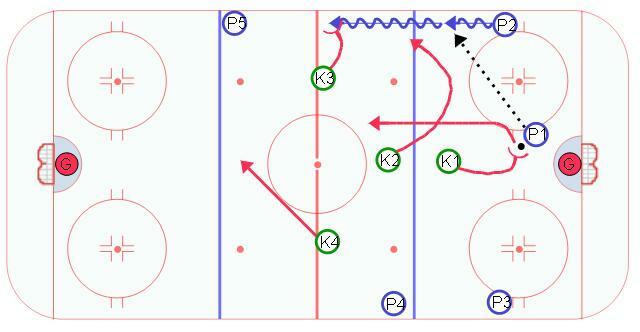 I Formation Penalty Kill Forecheck | Ice Hockey Systems Inc. This is one of the more common penalty kill systems. It requires the penalty killers to be passive and allow the team on the power play to carry the puck out from behind their own net. This diagram shows a standard power play breakout with the defense carrying the puck out from behind the net in the middle of the ice. K1 attacks P1 from an angle and forces P1 to make a pass to P2. K2 anticipates this pass and jumps P2 as he receives the pass. The goal is to force a turn over by P2. If done correctly P2 will have limited options and be forced into a turn over situation near the red line. K4 can drop back and anticipate the dump in by P2.